When the diaper got here, Stephanie and I were AMAZED at how soft it was. The outside, inside, and soaker are all so freaking soft!! I was excited to use it! I put it in the wash the next day, and put it on S as soon as it was dry. Luckily, that was a Saturday, so I got to see how well it worked first hand. I have to say I’m puzzled. I know The Munchkin is a big wetter, but it felt like the front of the diaper was wet…like it should have had a cover on it or something. I figured that maybe it was a fluke, and maybe I didn’t prep it right or something, so it got washed again, and I tried it… and the legs leaked. I thought maybe I didn’t put it on tight enough, so into the wash again! 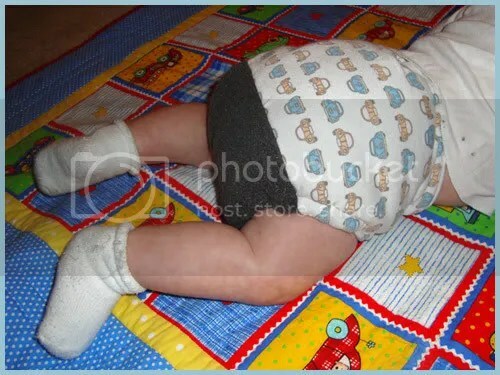 * The third time it worked perfectly, and the fourth, and I think from then on it worked pretty well, with only a couple leaks that were probably actually caused by me leaving the diaper on; not a flaw with the diaper! The diaper isn’t very bulky, despite being an AI2. It’s about as bulky as my pocket diapers, which I like a lot. The elastic around the legs is a little bulky, but it doesn’t look weird under clothes or anything. I just worry that it isn’t tight enough around my little man’s skinny legs. But again, it has worked most of the time, so I guess I’m crazy. End rating: 3.5 out of 5 hearts. I’m glad I won this diaper, and like using it, but I don’t think I would recommend parents with skinny legged children buy a whole stash of them. I think chubby legs can totally rock them though. 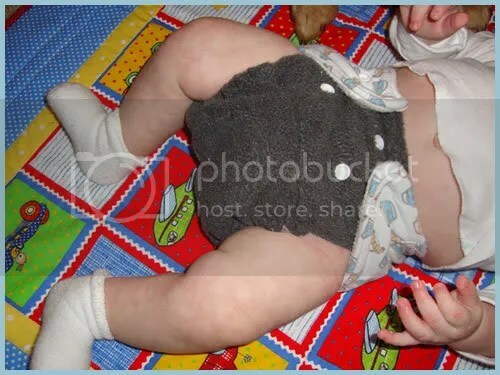 It is a good diaper to have in the rotation either way, and so cute! *Granted, these wearings were not all right in a row. I use this diaper about 2 times a week.